Our last night in Monument Valley had been our 13th in a row in our tent trailer Trailblazer. The original plans had us heading straight to the north rim of the Grand Canyon, but civilization was beckoning. One of the best things about our year so far has been a lack of reservations and definite plans. Although at times this has been a challenge for those of us type A personalities (i.e. Jason), it’s been great to be able to change plans on a whim. So, we rented a place on Airbnb in Flagstaff, Arizona and spent two wonderful days lounging around, getting our tech fix, going to thrift stores to piece together Indi’s Halloween costume, and (Jason) getting to soak in two full football games–unfortunately they were both Oregon State and Dallas Cowboy losses, quite a common theme this year. 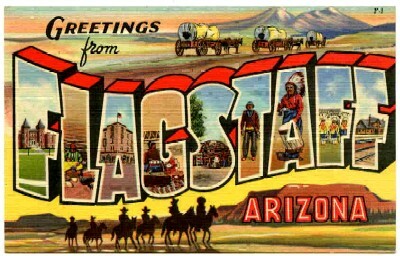 We were also pleasantly surprised by the cool town of Flagstaff with the same great vibe we’ve found in other college towns and much greener than what we ever expected to find in Arizona. We spent a ridiculous amount of time in Bookmans Exchange, finding amazing deals on secondhand books. It was like a smaller version of Powell’s City of Books, a favorite destination in Portland, Oregon. If you find yourself in this town, also be sure to check out Beaver Street Brewery and Whistle Stop Cafe for lunch. Windust stamp of approval! The downtime also allowed us to reach a couple of big decisions. First, we withdrew Indi from her online school. We were finding access to the internet a challenge, and more importantly, we felt like we didn’t have the time to incorporate what we were seeing and doing on the road into her education, a huge reason we went on this trip. Check out “Parks as Classrooms” for more information on what/how we’ve been teaching Indi (and learning ourselves!) through experiences in these beautiful and diverse environments. Secondly, as much of a trooper as Trailblazer has been, we’ve decided to upgrade to a small, hard-sided trailer for the second half of our journey. The thought of a non-leaking roof, no drafty gaps, and being able to cut down the time we spend packing and unpacking are proving to be too alluring. We’ll miss the ease at which we can pull a tent trailer, but if we get something small enough we hope that it will still be A-Okay behind the truck. We’ll most likely buy something used when we are home for the holidays and then resell it at the end of the year. Onto our 10th national park, The Grand Canyon. We’d heard the Grand Canyon is hard to describe, and with my limited writing skills (Wendy would probably have better luck), I won’t even try and express the scale and majesty of the place. Needless to say, we weren’t the least bit disappointed. I don’t now if our first glimpse of the canyon from the South Rim was the best I’d ever seen, but it’s definitely in the top five. We camped in the park at the Mather Campground on the South Rim, a sprawling but well laid out campground. You never felt too close to your neighbor, and it helped that it was mostly empty. We continued to be blessed with great weather. The nights were chilly, as is to be expected when you are 7000’ (2130 m) above sea level, but the days were sunny and beautiful. Our best memory from Mather was finding us surrounded by a harem of Elk, and the large buck that wandered up to us. During our three nights in the Grand Canyon, we did a short hike to the aptly named “Ooh Ahh Point”, walked the Rim Trail, visited the impressive “Desert View Watchtower”, and listened to a great ranger lecture on the history of the California Condor. During our last evening, we decided to have a sunset picnic on the rim. Despite being on the road together for the past 50 days, I guess Wendy and I still need to work on our communication. We got a late start, and I drove us to a part of the park she wasn’t expecting. On top of all this the clouds rolled in and hid the sunset that we were too late for anyway. But all was not lost. We set up on some rocks in front of one of the lodge’s restaurants, enjoying our 99 cent cup-a-soups while feeling sorry for all of the people behind us spending 10 times the amount on their soups… without nearly as good of a view. To Indi, these “campers” have become known as the “fancy people”. The time went by quickly and before we knew it, it was time to leave. Both Wendy and I felt the pull of the Colorado River and were disappointed that we weren’t able to hike to the bottom of the canyon on this trip. At the same time we’re confident we’ll return.